ByWayne J. 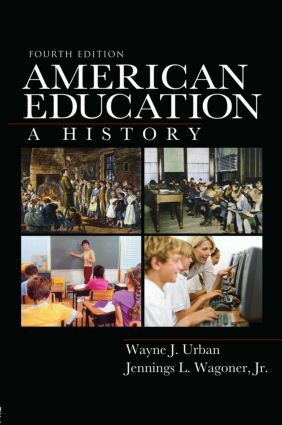 Urban, Jennings L. Wagoner, Jr.
American Education: A History, 4e is a comprehensive, highly-regarded history of American education from pre-colonial times to the present. Chronologically organized, it provides an objective overview of each major period in the development of American education, setting the discussion against the broader backdrop of national and world events. The first text to explore Native American traditions (including education) prior to colonization, it also offers strong, ongoing coverage of minorities and women. Balanced Perspective – The authors provide contrasting views of American educational traditions, reforms, and theories in order to maintain a balanced view of events. They focus on conflicts, compromises and outcomes (positive and negative) that have defined America’s educational past and that shape its future options. They also set discussions against the broader backdrop of national and world events. Pre-colonial Focus – A unique and much praised opening chapter discusses the educational traditions of Native Americans and the two-way learning exchanges that occurred between two distinct "old world" cultures, that is, between Native American and European cultures. The Indians taught as well as learned from the colonists. No other text has this feature. Cultural Conflict Focus – Throughout the text attention is paid to the cultural conflicts embedded in the majority-minority struggles of Native Americans and various immigrant groups throughout the nation’s history. Chapter 5: Class, Caste and Education in the South provides an in-depth analysis of the educational legacy of Southern culture throughout the 19th and 20th centuries. Readability – Reviewers have labeled this the "best written text on the market" in terms of style, clarity and interest. "It’s clarity and readability differentiate it from other books." Changes – The fourth edition will include more visual illustrations as well as substantial new material. A new epilogue adds closing comments on the present and future prospects for American education.